If It’s Asparagus, Why Does My Pee Smell Like Cabbage? Nobody tells you. It’s something you have to learn for yourself, the same way girls learn to pee sitting down and boys learn to pee standing anywhere. It happens when we least expect it—an offense that’s sinful enough to bring the devil to his knees—asparagus-induced urinary odor. If you’re like most people, you spend your childhood avoiding any vegetable not on a cob, much less one that’s green, pointy and prehistoric looking. But somewhere between your first cholesterol reading and your first heart attack, you stop eschewing and start chewing. You discover one night over dinner with friends that you actually enjoy asparagus. Until . . .
Fifteen to thirty minutes later you go to relieve yourself and your nose wrinkles—at what exactly, it’s hard to say—grapefruit, garlic, skunk? You presume that someone in the bathroom is either: A) Suffering kidney failure B) Brewing beer in the second stall, or C) Has discovered the technology to convert toilet water into sulfuric hot springs. Who let off the stink bomb? You wonder. You peer under the stall for a glimpse of the offender’s shoes, but no one is there. The only logical explanation is that, by some freak of nature, your own body has released an acrid odor of volcanic activity. You panic; worried the toilet bowl you’re sitting on might melt away. Your eyes burn. You’re tempted to light a match to mask the odor but fear you might spontaneously combust. You hightail it out of the bathroom, leaving the restaurant owner to worry about fumigation. “You won’t believe what just happened!” you pant to your friends. You spare them no details, except the part about dashing out of the restroom without washing your hands. Two of them appear sympathetic. The other four look at you as if you forgot to pull your pants up. Just my luck, I think. I can’t whistle to save my life, but I’m one of the chosen few who can produce odorous pee and smell it too. “Well all right, then,” I say, piling more asparagus onto my plate. Why not? The damage is already done. But little do I know . . .
“There’s one more thing I should tell you,” Judy says, holding up a finger. “What’s that?” I ask, as I swallow another forkful of asparagus. love asparagus, hate the resultant smell. But I’ve discussed with people some don;t smell it and others said it only affects men. I had no idea only 25% can smell it so that explains the answers I got. Unfortunately I can vouch for the fact that it does not only affect men! Well, Lisa, this is one more thing we have in common. Maybe we can start a club for us 25 percenters. Thanks, Ron. Let me know if you’d ever like to join my family for a nice asparagus barbecue. I’ve wondered about that. Dig the cartoon. Nice and simple and delivers. I try to do that style. I wondered about it too, which is what inspired me to research it further! I can’t take credit for the cartoon, however. Thanks, Google images! Very funny. Thanks for some good laughs! Thanks, glad you liked the post. Sounds like you keep a safe distance from asparagus. There’s plenty of other vegetables in the sea, er, in the garden . . . I never knew…thanks for another funny post! I wonder if people who blog are more likely to be in the infamous 25%? Any way, yes, I am part of the 25%. Sigh. That’s why God made Glade. I think it’s safe to say you aren’t affected. Believe me, you’d know! Uh huh; I used to think I was immune to Poison Ivy until I got caught in a patch, itched and itched. So maybe if I paid more attention I’d know I wasn’t immune to the asparagus problem either. Thank you so much (?) for bringing this to my attention and awareness. Not one of the chosen few! Never smelled a difference. Your eloquent description of the asparagus’ odoriferous qualities can only be rivaled by Tom Robbins description of asparagus consumption and its aftermath in “Half Asleep in Frog Pajamas.” I can never eat asparagus and not think of that book … and, now, I will have the same reaction in recalling this hysterical column. If you haven’t read his book, I highly recommend it. Why thank you, Judy! And thanks for the recommendation. I’ve never heard of it but I will be sure to check it out! Asparagus racing, the next Olympic event . . .
One for the smellers and one for drinker of rotten milk (aka no smelling capabilities for the ole asparagus = husband). This should be a mandatory food item at EBWW. Talk about bathroom laughs! Very funny and educational. I’m thinking there should be warning signs posted in public restrooms . . . Yes, I’m one of the chosen. Wondering if I should add it to my LinkedIn profile. LOL! Not sure if that one is an asset! I think that is EXACTLY what needs to get LinkedIn up and hopping! Wouldn’t that be hilarious?! I can just see the 3rd tier connection requests rolling in. I smell it and it really smells like (strong) asparagus, not cabbage. I read an article about this a few years ago and it says a larger percentage of French people have the smelling gene than other countries. I’m French so I’ll second that, and now my kids can smell it too and it doesn’t bother us one bit. We just find it funny that we can make our pee smell (boys!). Yes I do have the gene and can smell it too. Still love asparagus, though. Did you know it’s a member of the lily family? Interesting, I did not know it was a member of the lily family. Its after effect should only smell like a lily! RIght up my alley (yeah, my alley has pee in the corner). I feel sorry for your alley cat! This was totally enlightening to me – I had no idea. I’d have to be one of the percent who can’t smell it. I have never smelt it! It’s always good to get a pro’s take on things!! I hope now you’ve found the answer! I’ve never tried Asparagus myself Lisa. What a great post. And yes, I’m a member of the 25% club. This reminds me of the first time I took medication for a kidney infection … turned my pee red. I ran to my manager and said I had to rush to the doctors because I was bleeding internally and peeing blood. I was only 24 so that’s my excuse. And thanks for liking 1950 Suburban Adventures. Sounds alarming. The kidney infection meds should come with a warning label. Come to think of it, so should asparagus. 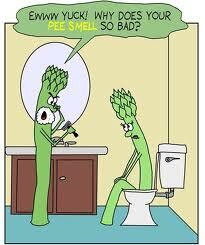 . .
I’ve never had the asparagus pee adventure but yes to a similar phenomenon after drinking beer. The beer pee did not smell like cabbage, it was like, well… more beer. Which brought on a brief in-head conversation similar to: “if it smells like beer can it possibly be beer and save me some dollars per bottle plus tips”. Luckily the band started playing again so I walked out of the head and did not proceed with any ill advised experimentation. Now that’s a sobering thought! Asparagus pee is one of the ways I’ve tried to con my son INTO eating it. At eight years old, it’s a badge of honor, not something to fear. My wife tells me to stop egging him on. Laughing out loud! So delighted it is at your expense! I must be special– I can pee anywhere, whistle and smell! A little secret; it’s an almost immediate reaction. You don’t have to wait to experience the phenomenon. Very funny post! I went ages not realising it was my pee – it smells like a stale dishcloth to me and i spent many an hour hunting for the invisible stale dishcloth in the bathroom! When I finally realised it was my pee smell, strong enough to last even after I’d pulled the chain, I googled “smelly pee” thinking there must be something very wrong with me and came across the asparagus link. As I had just eaten asparagus and it only occurs when I have eaten asparagus, I have now stopped hunting for the stale dishcloth and just pour lots of fresh smelling toilet cleaner down the basin after an asparagus meal! I’ve read that scientists are developing a new apple that doesn’t brown when cut. Maybe there’s hope for asparagus!